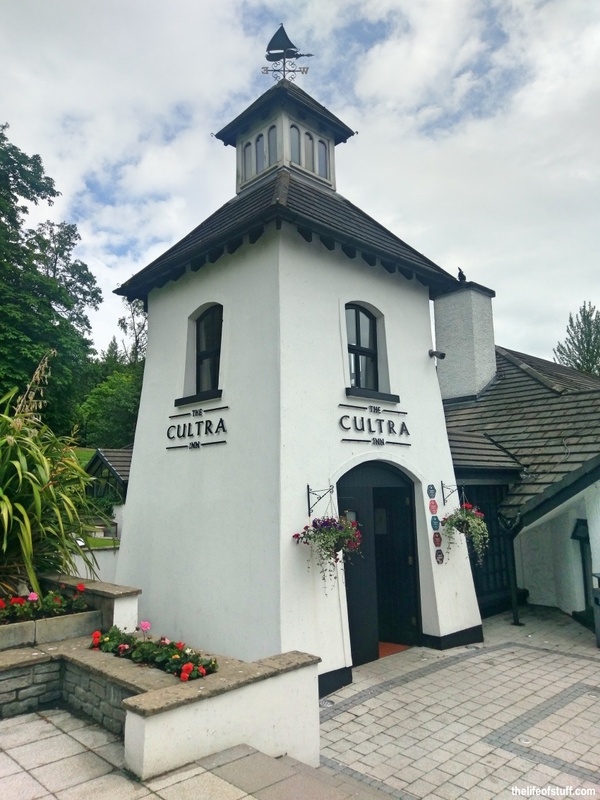 Culloden Estate & Spa is about a 15 minute drive from Belfast City Centre, yet standing on the slopes of the Holywood Hills it feels like it’s in a world of its own. 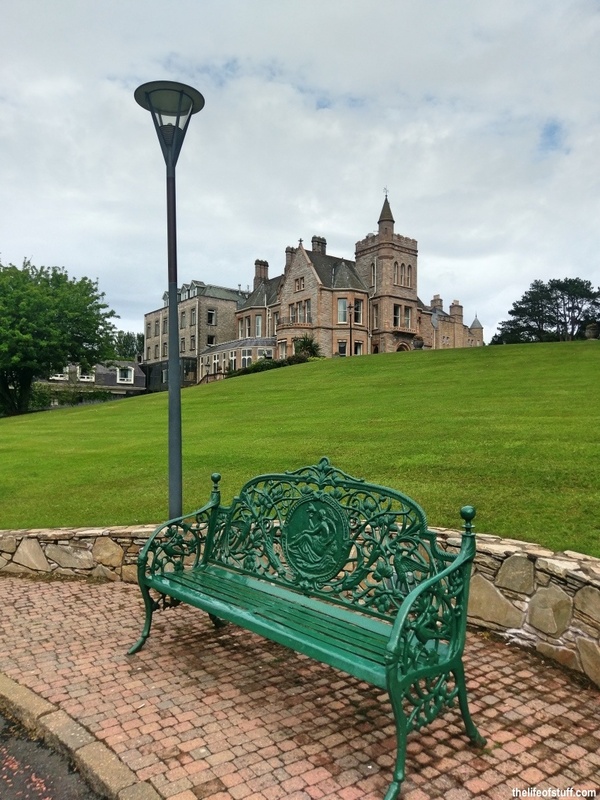 With stunning views of Belfast Lough and the Antrim coastline and countryside, it’s no wonder it was chosen as the site to build a palace for the Bishops of Down 140 years ago. 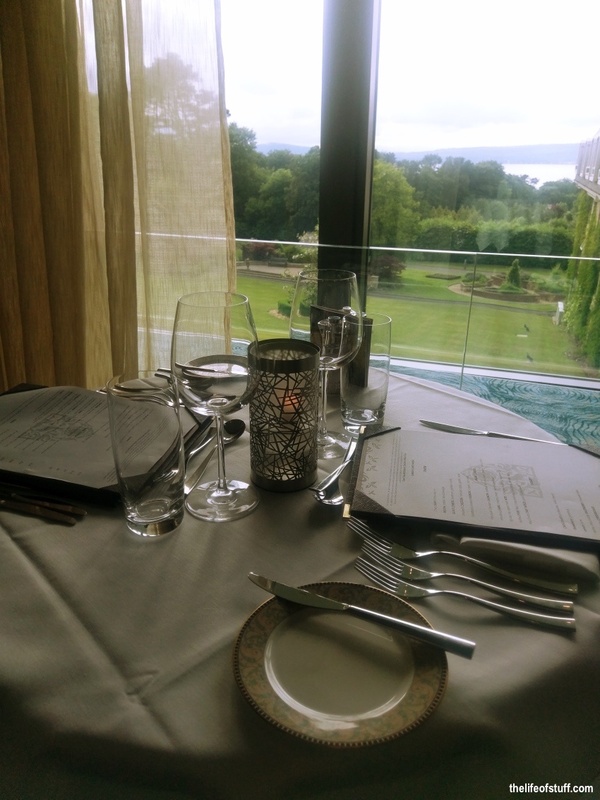 When we arrived from an excursion to the Ulster Museum and Botanic Gardens in Belfast it was overcast and rainy but even so Culloden Estate & Spa felt warmer. In actual fact it was warmer, approximately three degrees warmer! If you’d like to know why you can visit the Culloden Estate & Spa history page here. 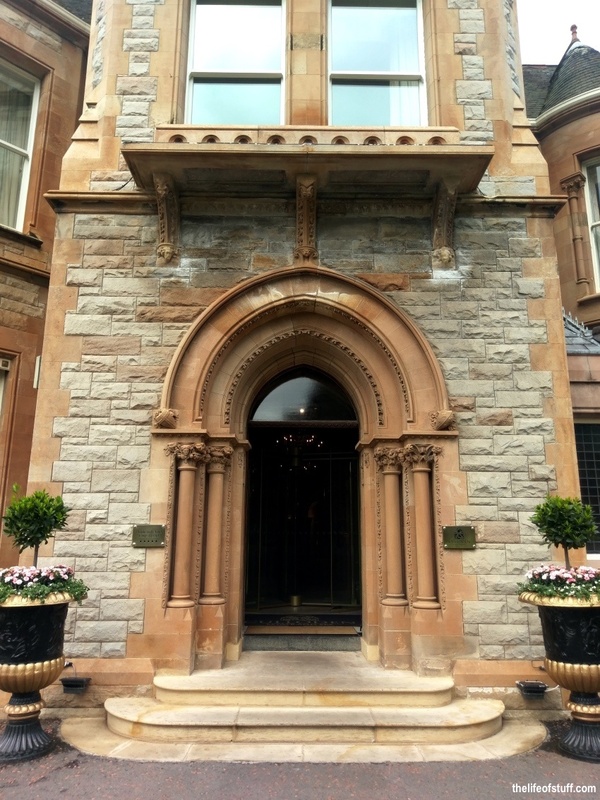 The entrance to Culloden Estate and Spa is magnificent both inside and out. However before we even checked in, I couldn’t resist taking the steps down from the hotel to look back at it in all its glory. A beautiful architectural sight to see. Check-in was a breeze and we were warmly welcomed by the concierge on duty (whose name has unfortunately slipped my mind – I’ll update this part later when I find out) who helped us with our luggage and gave us a tour of the hotel and its amenities on our way to our room, the ‘Blackwood Suite’. Our room was both spacious and luxurious. The floor to ceiling shuttered windows allowed for lots of natural light to flood the rooms. Our bed for the night was dressed in crisp white cotton. The pillows were soft and the mattress cloud-like. I always say it’s the little touches that make five-star service what it is. 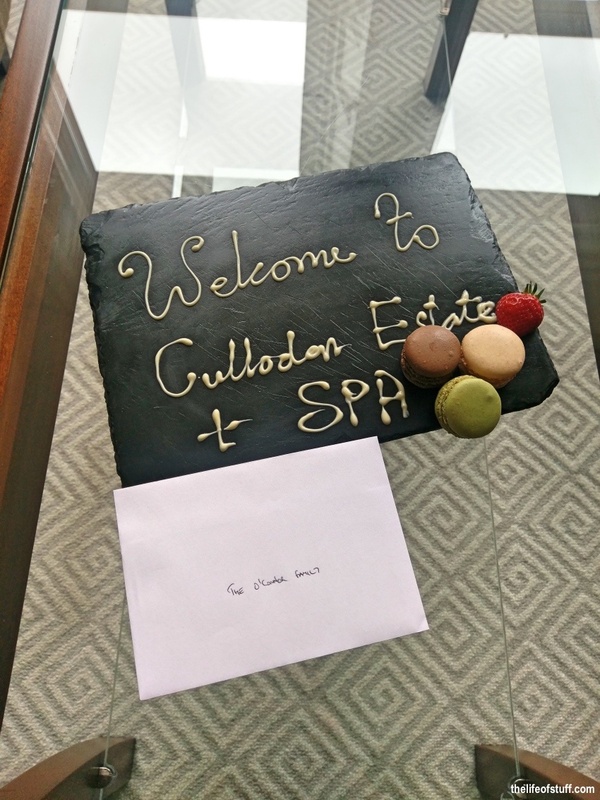 Culloden Estate and Spa delivered. A handwritten note to wish us a happy stay with macaroons. I love macaroons. 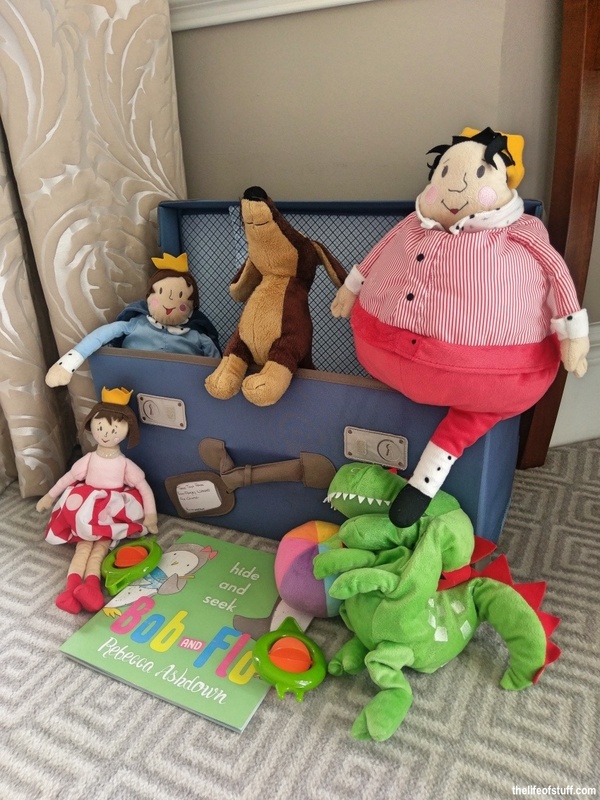 Freshly washed toys for Smith to play with, and a cot dressed appropriately for a 15 month old. Let’s go back to the views. Here’s the view from the living area. Here’s the view from the bathtub. However the ‘pièce de résistance’ was the view from our bedroom and the balcony that overlooked the garden. Absolutely gorgeous, even on a cloudy day. … but I’m losing the run of myself … back to the day time and soon after we checked in, took in the views of and from our room, it was time to explore the gardens. 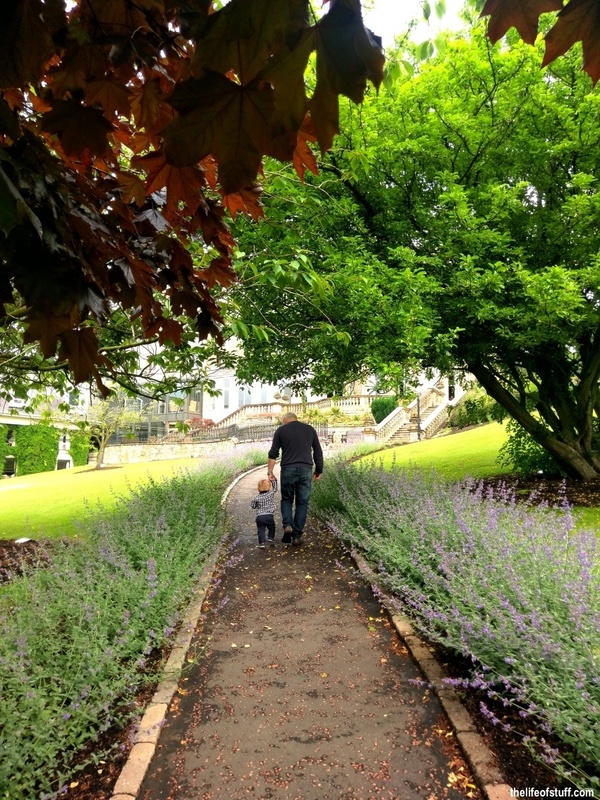 The gardens were ideal for feet, little and large. 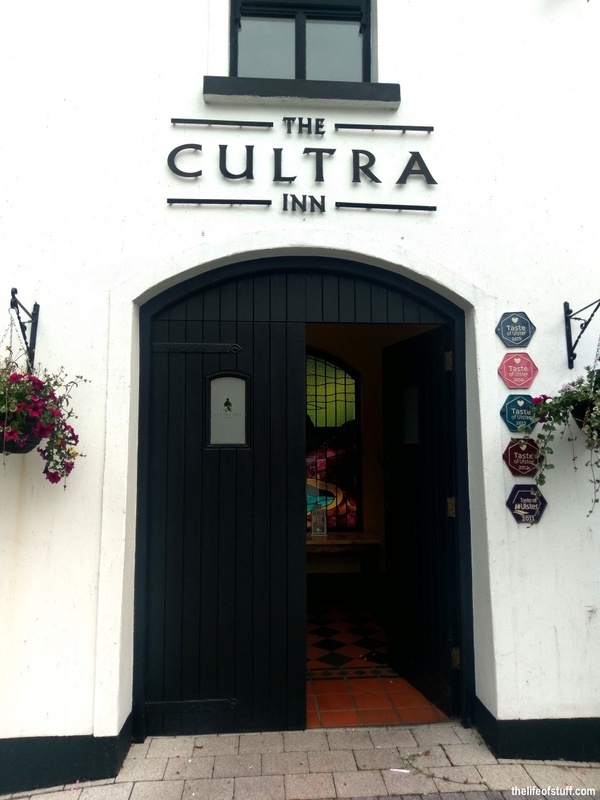 We even stopped off at the award-winning ‘The Cultra Inn’ for a drink before dinner. Dinner was reserved for ‘The Mitre’ restaurant within the hotel. I was really looking forward to experiencing Chef Paul McKnight’s creations. Only the freshest of ingredients are used in his kitchen including herbs from Culloden Estate’s own Herb Garden, and locally sourced, seasonal produce. 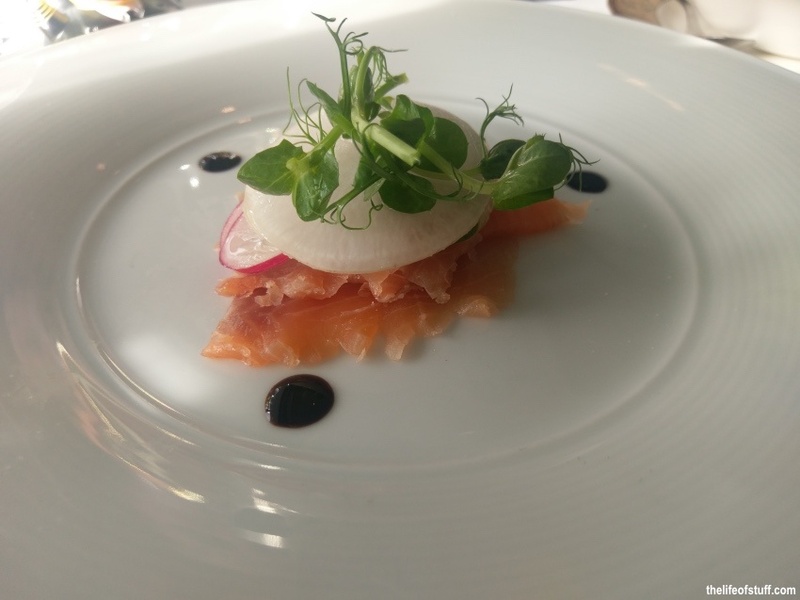 For starters: Patrick chose the Glenarm Salmon, ruby blue aged vodka, cucumber, black radish – each flavour complimenting the next with none fighting over the title. 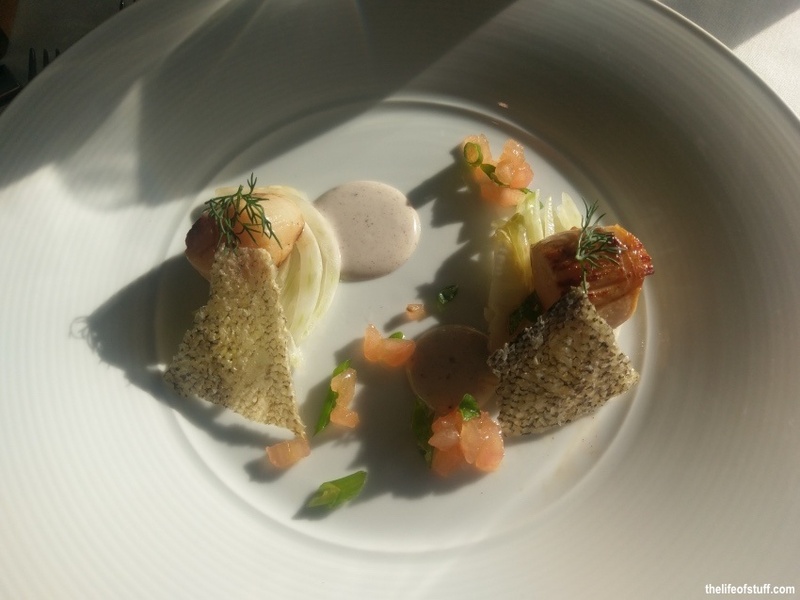 I chose the Scallop, seaweed, fennel, tomato – for me this dish was all about contrasting textures and flavours, crispiness versus softness, sea versus land. The scallops were cooked to perfection. 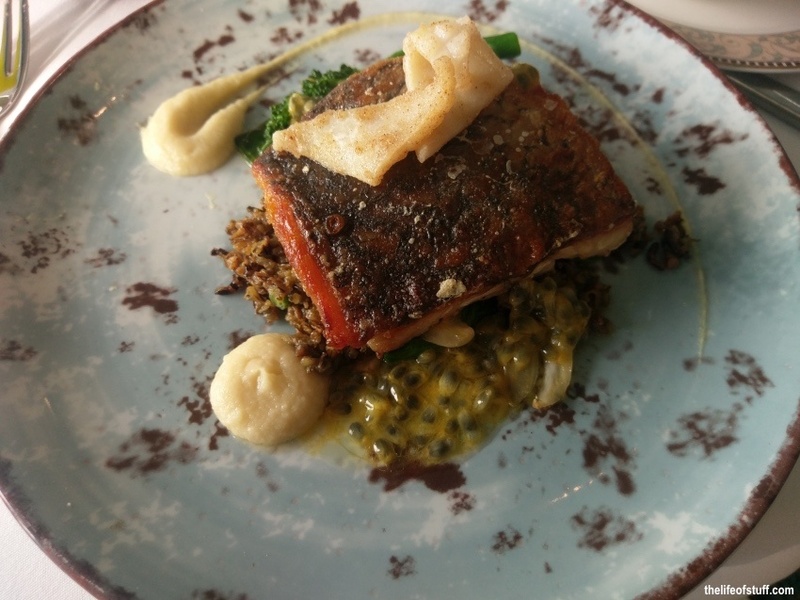 For main courses: Patrick chose Stone Bass, black rice, passion-fruit, crisp squid – the photo of this dish says it all really (make sure you click to zoom). 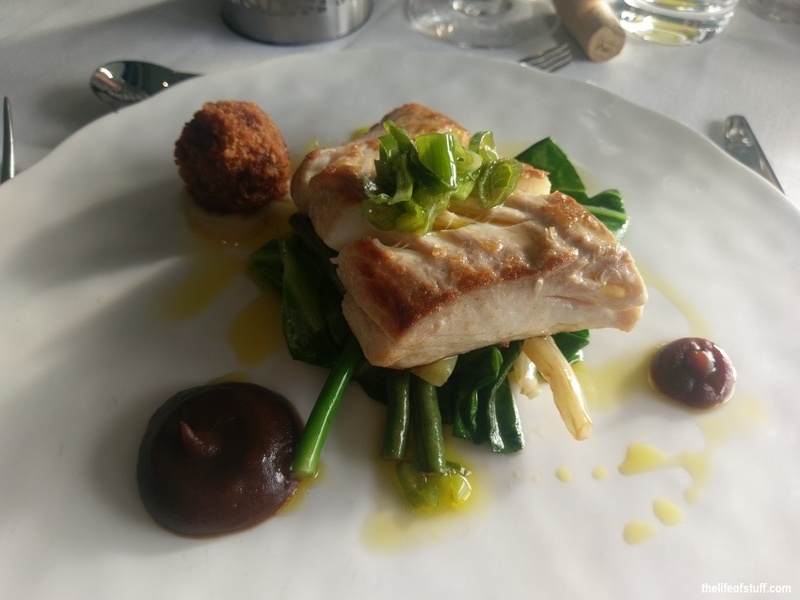 I chose North Atlantic Halibut, pork, white bean, apple, butter – the fish was deliciously meaty, the addition of the pork, complimented by the apple was like a surprise waiting to be opened. 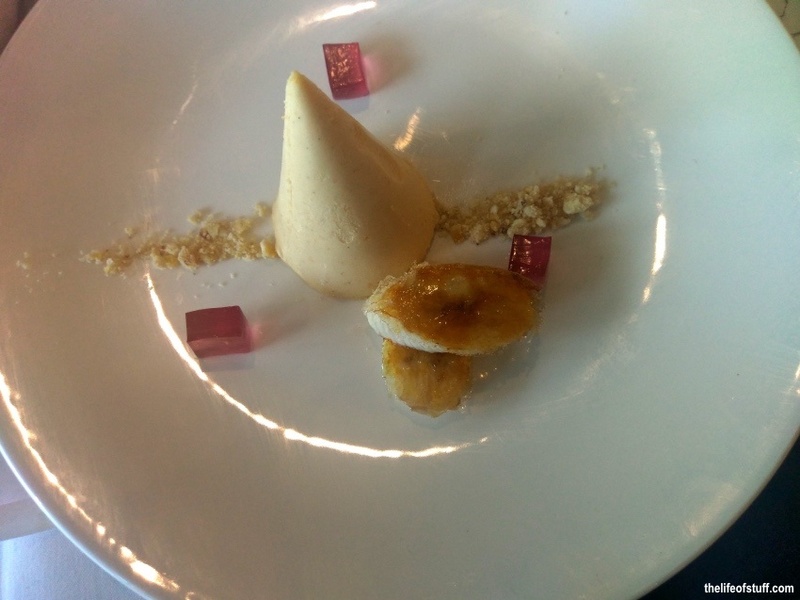 For dessert we shared: Peanut Butter, chilli, banana – the cool yet spiciness of the chilli jelly cubes with the sweetness of banana together with the peanut butter flavours, I loved this dish. 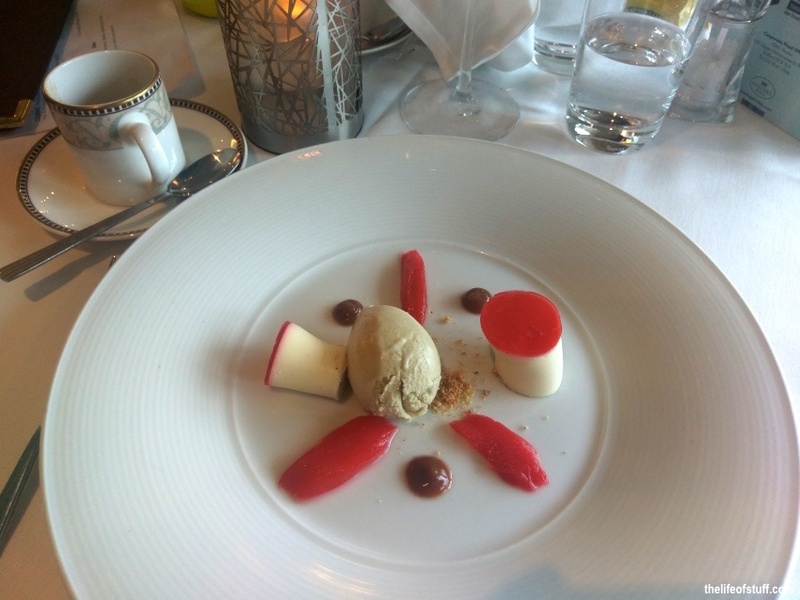 Rhubarb, ginger – rhubarb panna cotta with the creamiest of ginger ice-creams. I want my rhubarb tart like this in future please. Our meal was thoroughly enjoyed with a bottle of Eric Louis de la Pauline Sancerre. It ended with an espresso, and our compliments to Chef Paul McKnight and Kevin who looked after us throughout the evening. More food photographs? Well after a very sound sleep I woke to find myself a year older! Don’t worry no magical spells involved. It was just my birthday, and what better way to celebrate your birthday than wake up with the two loves of your life (husband and son) in a gorgeous five-star hotel! Our morning was spent with a stroll to the pool, a laze in the jacuzzi and Eggs Benedict! 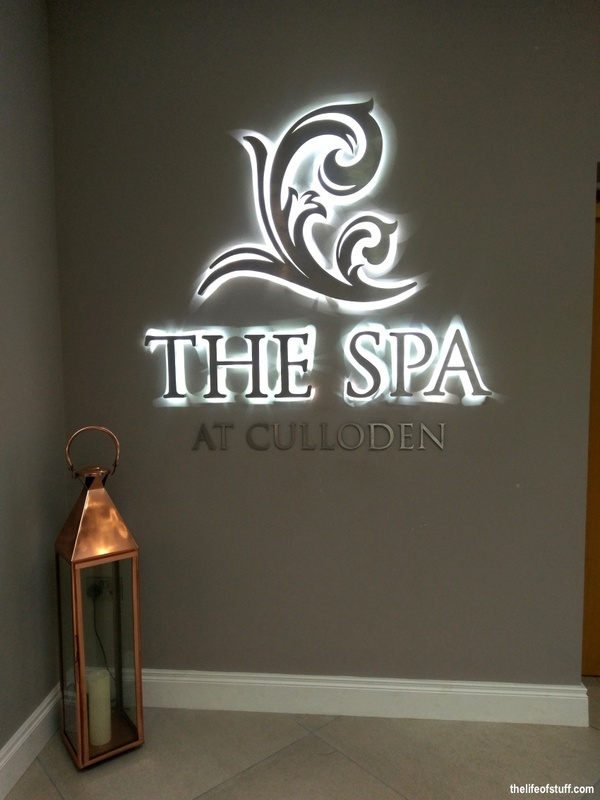 The Spa at Culloden keeps the luxurious flag flying for Culloden Estate. The Spa with its gorgeous big sky light has a full gym, sauna, steam room and the aforementioned jacuzzi. It also has a Zest Juice Bar, outdoor and indoor seating area and every treatment you can think of to pamper yourself. It’s definitely five-star. I could have been Cleopatra swimming in milk! Instead I was Edwina, chilling in bubbles. I could have stayed much longer, and although as a guest you are permitted to use the spa until 3pm the day you check out. It was time for us to go. 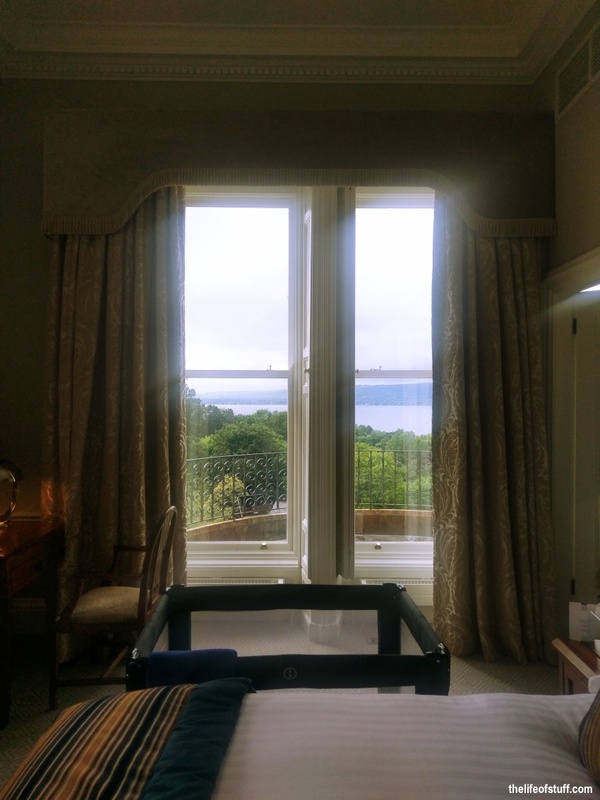 We loved our stay at Culloden Estate & Spa. Originally built as a palace, to me it still is and I’d be its queen anytime. Culloden Estate & Spa is as I mentioned is only 15 minutes from Belfast City Centre so it opens up the city for exploration. 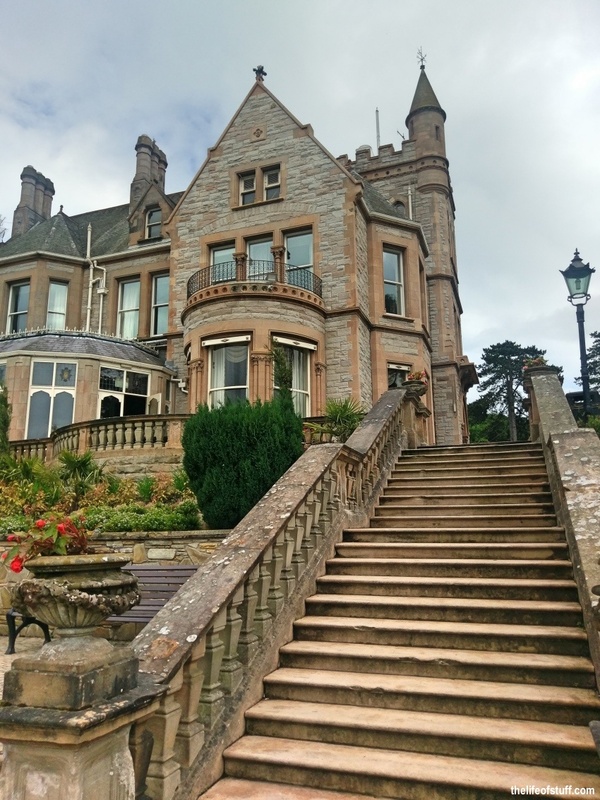 If you feel like exploring a little nearer or further afield; the Ulster Folk & Transport Museum is five minutes away, Stormont Estate and Parliament Buildings are 10 minutes, Mount Stewart House 25 minutes, or Hillsborough Castle 30 minutes. Of course the lovely towns of Holywood and Bangor are also on your doorstep … but so too is the coast road! So you can always do what we did and head north up along the Antrim coast and stop at Ballygally Castle Hotel, Culloden Estate’s supernatural sister (she’s haunted) for Afternoon Tea, a walk along the beach, weather permitting, and a visit to the Ghost Room … but that’s a story I’ll tell you about another time. 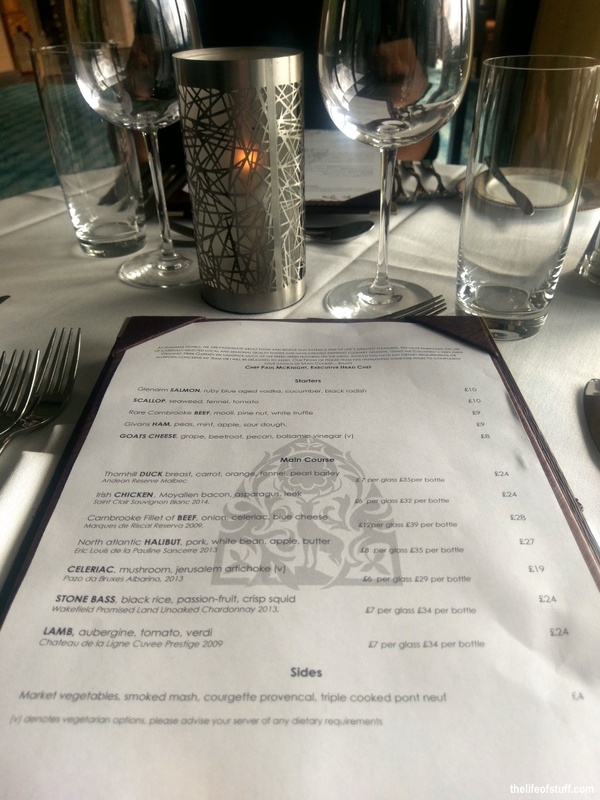 *** Many thanks to Hastings Hotels for upgrading my ‘Meet & Mingle‘ Belfast Blogger Event prize of a four course meal at Mitre Restaurant to include one nights stay. 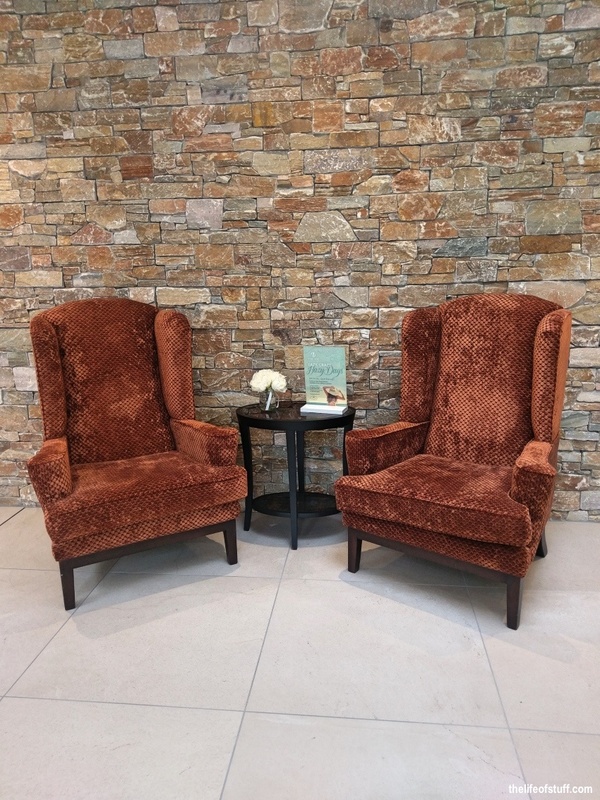 ‘Meet and Mingle’ was a fun blogger/social media event organised by Michael McCrory of Duffy Rafferty and Hannah Corbett from Hastings Hotels. It was held in the Europa Hotel. Looks like you had a really fabulous time. 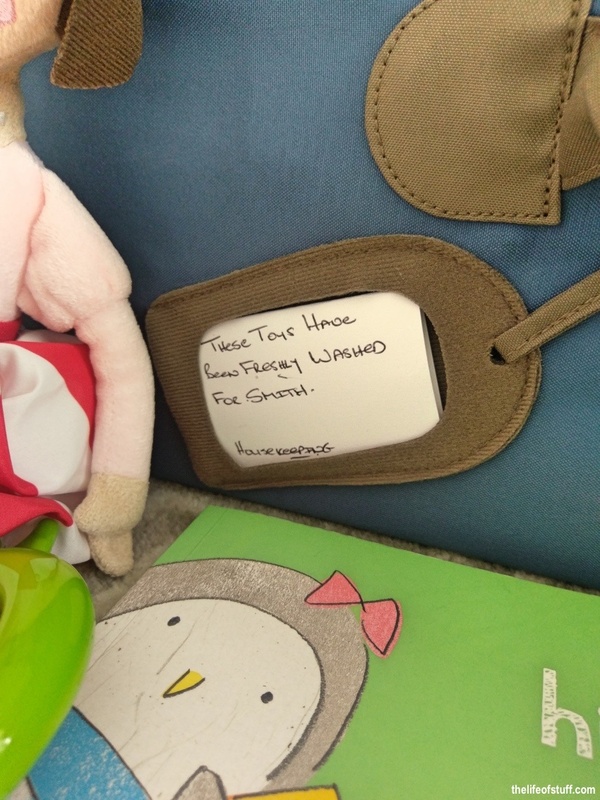 We’ve always been looked after so well by everyone at the Culloden on all the stays over the years, always with an effortless-seaming kindness which is so rare. 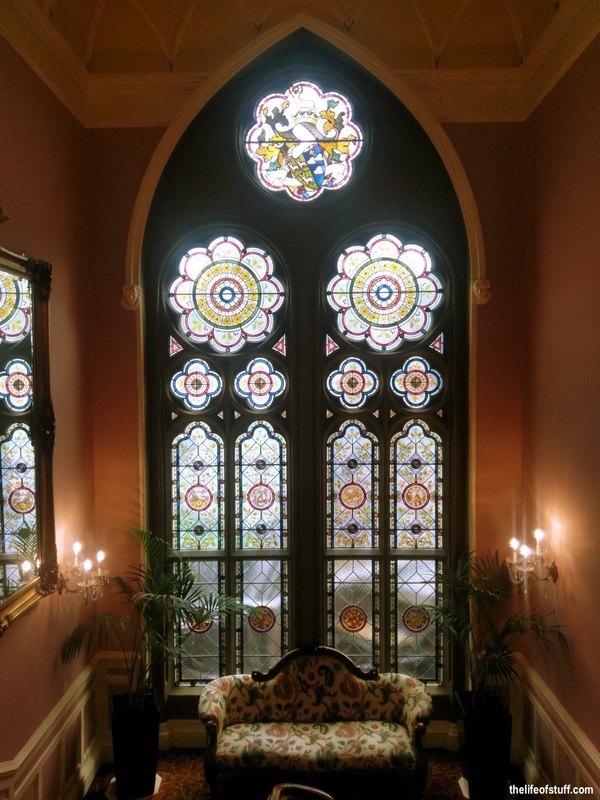 You got the most gorgeous traditional suite in the original mansion (what a treat!! 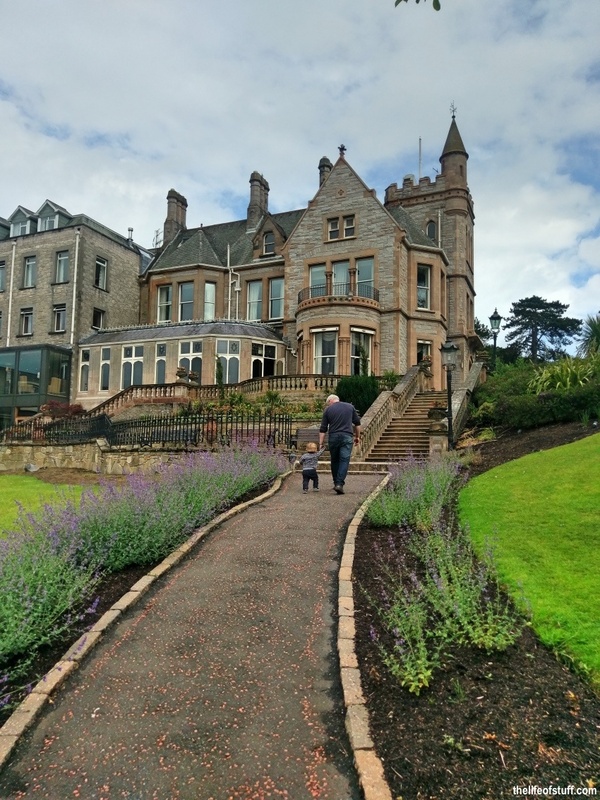 ), but guests who prefer a modern style will be pleased to know that there’s four groups of suites and each room is unique with its own distinct decor, but the Troon and St. Andrews suites (with their fabulous tiny turrets!!!) are breathtakingly modern with crisp clean lines in duckegg blue with working gas fires to boot. And the junior suites (Islay, Jura, Kintyre have that fabulous view that you can just gaze at all day and night). 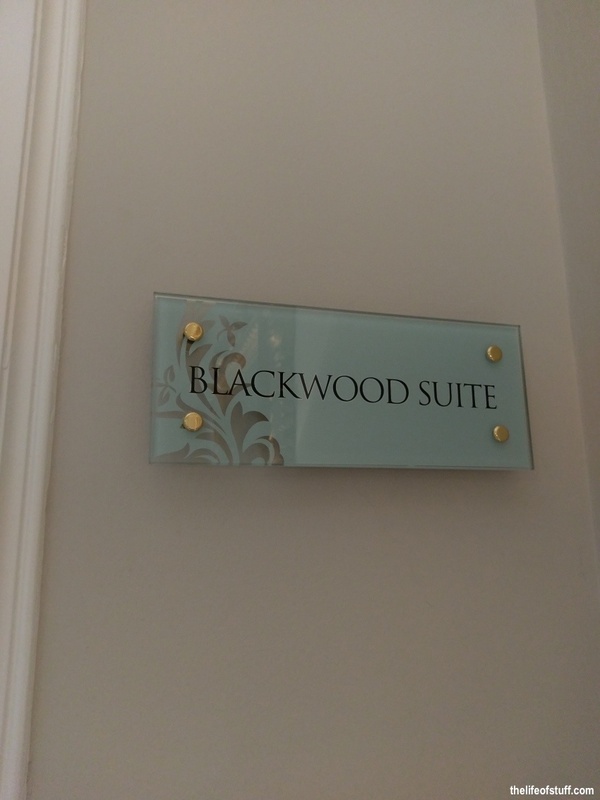 Even the superior rooms are gorgeous and are the closest to the spa and breakfast room, so everything is really well thought out. One thing that surprised me on one visit was coming in very late and finding them changing the carpet to the same design, this was during the recession, and I realised that in order for something to appear so timeless and unchanging, it takes a huge amount of work, creativity and effort, and to do this AND put in the gorgeous upgrades (such as the beautiful new bar with its open fires), and the several outdoor seating areas, and the breakout zone at the event space, just makes it somewhere very special indeed to everyone who’s been. And of course it’s a super popular venue for weddings and balls, so a lot of people have special memories formed there that they can return to year after year.